This quilt hangs in my office so that I can admire it every day. 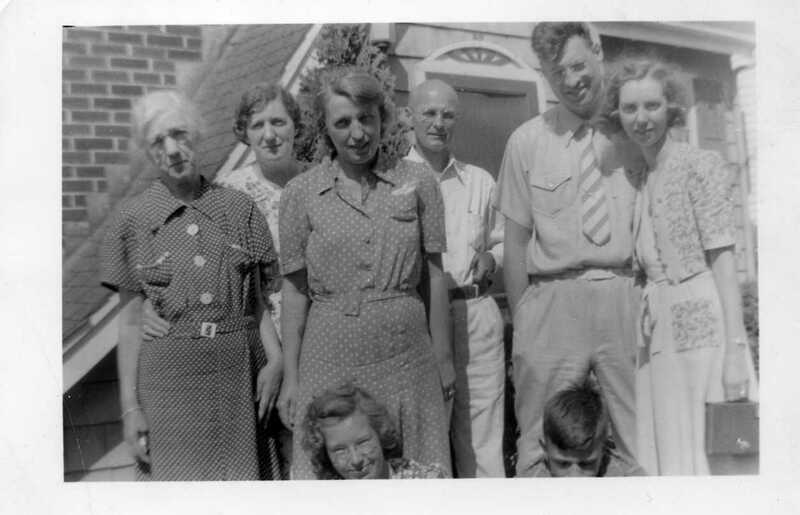 It was hand sewn by my great grandmother, Lucinda (Leaman) Thurston (far left in photo below), in 1939 as a wedding gift for her son, Roy, and daughter-in-law, Mabel Robinson (far right in photo). Double wedding ring quilts were very popular and used up small scraps of leftover fabric. The rounded bias piecing was tricky business and the interlocking rings symbolize the joining of two people into a couple. foot of her bed. But seeing the sunlight on it, she was afraid it would fade. So she had packed it into a trunk for decades. She said it was a shame that it was hidden away and made me promise to use it. What a dilemma! Two quilts, one loved to bits and the other cherished but never used. As a compromise, I have hung Great Aunt Mabel’s double wedding ring quilt in my home ever since. Unlike my grandparent’s quilt, it has never been washed and the pencil marks that guided Lucinda’s hand stitching are still visible. But it is still enjoyed every day.